You can pretty much find a convenience item for anything these days including pre-diced, veggies, instant potatoes, frozen pizzas, etc. Sometimes it’s handy to be able to rely on these types of foods, but I think for the most part we should be preparing them ourselves. The more we can make from scratch, the healthier we will be and the more money we will save. I already make a few of these items listed, but a lot of them I plan to try soon and I’m pretty excited! 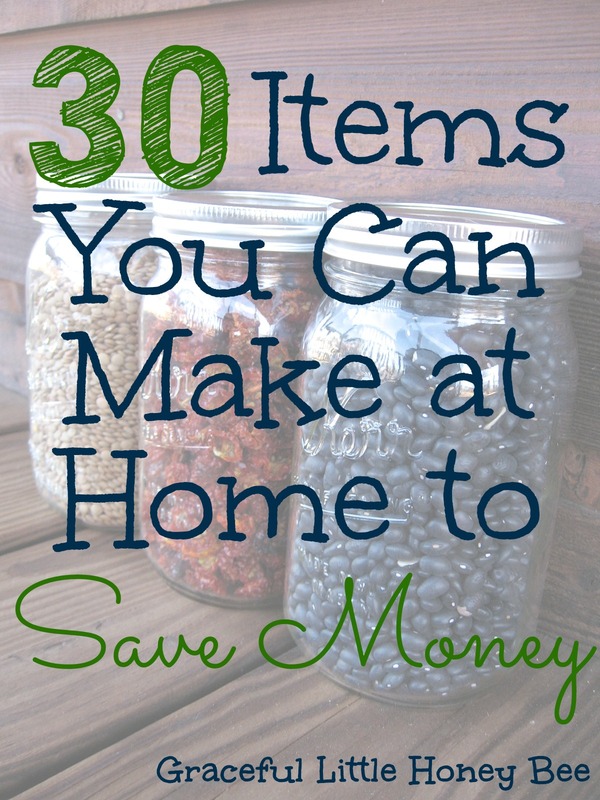 So here are 30 items you can make at home to save money. Do you make any of these? I’d love to know! This is a fantastic list! Thank you for sharing our hand sanitizer and Neosporin-like cream. Pinned. Great list! I've just started making my own cleaning products with castile soap and essential oils. It saves money and is safer than the toxic stuff. I hope to tackle homemade laundry detergent in the near future! Thanks for the awesome list! I will definitely have to try to make a few of these! My husband can't have salt, so I make most things from scratch. I make taco seasoning, ranch, and seasoning "salt", all without salt. I also make biscuits, bread, muffins, tortillas,-just about anything without salt or sugar. ID BE INTRESTED IN THE NO SALT RECIPES, MY HUSBAND HAS STAGE 3 HEART FAILURE. I make a few of these at home like taco seasoning and biscuits. I should definitely do more thought. Thanks so much for sharing this excellent resource, Missy! Pinning this to my DIY board for sure. I do a lot of these, but there are still a few left for me to tackle. Thanks, again. Enjoy! I definitely want to try some of them too! Love this list! Do you have a twitter handle? Wanted to share this with my followers! @honeybeegrace Thanks so much for sharing! Can't wait to try some of these. I make as many things as possible. All my laundry & cleaning supplies, seasoning blends, marinades, bbq sauce,dressing & soup packets, dry mix cream of anything soup base, DIY 7 grain pancake mix, granola, yogurt, cake & brownie mixes, hot cocoa, hamburger helper & so much more. It all started because I just couldn't stand paying outrageous prices for things that are bad for the environment and worse for you. This is a great list. I never considered making granola bars. Thanks! Great list! I want to try some of these! Thank you for sharing! I had never thought of some of these before :). By the way, I found you at the Homemaking link up today! God Bless! Thank you for stopping by Sarah! Great list! I love making things from scratch not only to save money but to control what ingredients I'm eating. No fake stuff and unpronounceable things. I would add sauces and salad dressings to the list. You can find tons of easy recipes for them! These are great suggestions! I try to make as many "store bought" items at home as possible but your list is much more comprehensive than what I do. You've given me some fun new ideas...and more to-dos for my husband! Sage and honey cough syrup! Thank you!!! I make my own seasoning blend's such as copycat Mrs. Dash,taco seasoning,cajun blend and a spicy popcorn spice. All baking I do from scratch out of the need to avoid sulphites. Since starting a real food diet have got off crackers and junk food and that saves a lot of money. Homemade trail mix and popcorn are the usual snacks around here now. This is the second summer that DH and I both doing our own refrigerator pickles. It is so easy and it makes me mad that all national brand pickles that I can find in the stores are produced overseas. Making cleaning products was my first foray into greening my lifestyle. A good resource is the Queen Of Green's website and FB page. Definitely a money saver. Thanks for the great list since it's through pages like yours that I have found more to add to what I already make. Super easy eye glass cleaner. Half alcohol, half water, 2 drops of liquid dish soap. I have mine in a small travel spray bottle from dollar tree. Works perfect! Thank you for these lists they are great. very well done, thank you I'll be doing this for sure. I use ground oatmeal as a facial cleanser. I also use a facial freshener made with one quarter cup apple cider vinegar and one cup of mint tea. I only count 15 things on this list of 30... What am I missing? There are definitely 30 items on the list. Maybe an ad split it up? Just keep scrolling and you will find the rest.